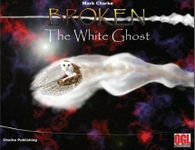 Charke Publishing is proud to present the 6th book for Broken - Broken: The White Ghost. It's 60 years since the destruction of Solaris and the survivors are enjoying a Christmas of sorts. Don't expect Saint Nick or reindeer but instead stories of a giant eight legged horse ridden by Odin. This is, after all, a Norse tale. Survivors are visited by the most unlikely of angels, a great white owl. In this short adventure characters are given a Norse Christmas in the void with a chance for stories, hope, to save people and to receive gifts! This adventures is 8 pages of full color, plus cover, credits and liscense. A print friendly version, without the ink intensive, full color backgrounds is included.